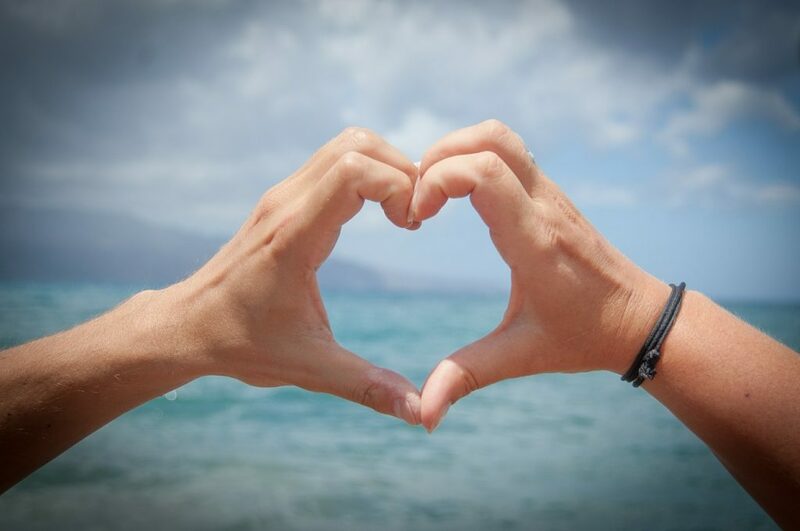 What could be better than surprising your loved one with a romantic getaway? There are so many places around the world that offer excellent couples packages, seductive experiences and fine dining that will leave you wanting more. As with anything couple related, you will need to consider what type of hotel will suit you and your significant other the best. There are many destinations around the world ideal for couples. Are you the kind of couple that enjoys privacy and isolation? Then Am Lam Ninh Van Bay Villas in Vietnam may be exactly what you are looking for. You can only access this resort by speedboat, and each of the 35 villas has a private pool. You have access to your butler who will see to your every whim, from arranging romantic picnics, drawing a bubble bath, or popping a bottle of champagne for you and your partner to celebrate your love. If you and your lover enjoy the outdoors, you will adore the Little Palm Island Resort and Spa in Little Torch Key, Florida. The action starts with a boat or seaplane ride to the island, where you can then enjoy the romantic thatched-roof bungalows. Each suite has an outdoor shower, and you may get to see some deer as you soak in nature. It is not too rustic though, and you can still enjoy the champagne turn-down service in the evenings. When you are celebrating one of the bigger anniversaries, you may want to go all out when surprising your partner. At the Peninsula in Paris, France, you are greeted at the airport by a chauffeur who will drive you to the hotel in a Rolls Royce Phantom. Once you reach the hotel, the opulent service continues as you are ushered to your suite. The fireplace and crystal chandeliers are just the start. Looking out of your window you can see the Arc de Triomphe and the Eiffel Tower (see tour cost). You and your beloved can complete the experience by having champagne on the rooftop overlooking the Parisian rooftops – it doesn’t get more romantic than that. Spending uninterrupted time together is sometimes really tricky. Modern technology has invaded so many areas of our lives, which escape is almost impossible. But at Landera in St. Lucia, you can stay in one of the three-walled suites, none of which have televisions or phones, just the sound of the birds tweeting in the trees. Each of the suites boasts the ultimate in privacy and has views if the famous Pitons. The private plunge pools allow you to cool off together before enjoying a ‘massage your mate’ treatment. If you and your loved one are freer with your bodies, Couples Sans Souci in Ocho Rios, Jamaica may be right up your alley. This resort is an adults-only space where bathing suits are optional. You can enjoy time soaking up the Caribbean sun in the mineral pool with a fresh cocktail. 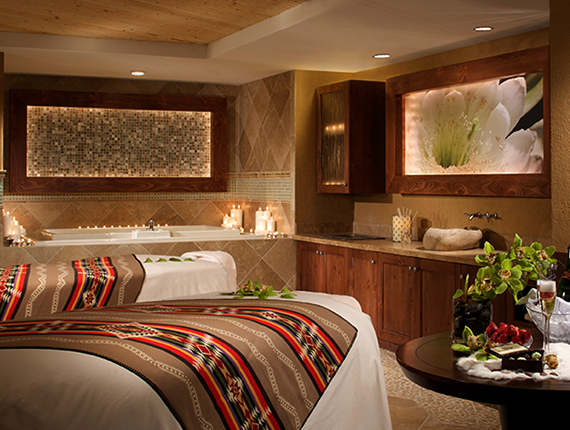 Couples massages and excursions are the perfect way to spend some one-on-one quality time with your partner. If this sort of thing excites you, have a look at jamaica hotels – jamaicahotelreview.com. What could be more romantic than a quaint vineyard soaked in history and surrounded by breathtaking mountains? At Le Quartier Français in Franschhoek, South Africa, that is exactly what you will experience. You and your beloved can enjoy your time tasting the best local wines over decadent dinners prepared by renowned chef Oliver Cattermole. The most romantic room on the property is the Four Quarters, which opens onto a private courtyard which is filled with lanterns – perfect for an evening drink together. There are so many different options for romantic getaways, so you will undoubtedly be able to find something that will suit your couple style. The above hotels are all topped to the brim with romantic experiences and chances to make memories that will last a lifetime. You can see the best hotels in Cleveland Ohio 2018 here. Do you want to stand out from the crowd? How about if you get yourself some decent clothes from some of the best stores? Whether a vacation is drawing nearer or you just want to look decent, do yourself a favor by getting some new clothes. It’s your time to shine! Here are four online stores that you can check out for new clothes before a vacation. If you’re looking for today’s most exciting and daring fashion clothes, then Zaful online store is your ultimate destination. With their affordable and exceptional quality clothes, you can rest assured that this online store will meet all your clothing needs. Zaful is committed to providing compelling fashion designs alongside providing quality, exceptional, and superb customer service. This online store understands that fashion is more than a style, and this explains why their designs are unique. Shein online store started as a small group of fashion lovers in 2008, and it has grown immensely to what it is today—a multinational store. This store takes pride in providing trendy styles to both teens and young women. It has been able to stay on top of the competition since its inception because of their commitment to bring new styles to the market. Regardless of the design and style you’re looking for, you’re almost guaranteed that you’ll find it in Shein. Initiated by close friends with deep passion for fashion, RoseGal has grown to be one of the most reliable online stores. Through its efforts to offer unique styles of shoes, clothing, and accessories, RoseGal has been able to capture the hearts and imagination of many of their customers. With a committed professional service, this online store will for sure exceed your imaginations. As a leading supplier of the latest clothing, shoes, bags, and other accessories, SammyDress guarantees you a good shopping experience. This global fashion retail company is committed to providing high-quality trendy clothing at customer-friendly prices. Despite the fact that all purchases are done online, Sammydress sees to it that you get what you purchase as soon as possible. Thanks to their professional packaging and fast shipping. This fashion store also has the best customer care service, and thus you can always get help. If you’re looking for new clothes to put on during vacation, your time is now. Do something before the vacation. Invest in new clothes and look stunning! Check out for new clothes in the above online fashion stores and feel the difference. It’s safe to say that New York City is one of the most popular travel destinations in all of the United States. Whether it’s your first time visiting The Big Apple or you’ve been here a few times before, you’ll want to come prepared with a list of amazing things to do! To help you out, we’re making the decision a little easier! We’re sharing what to do within your first 24 hours of visiting NYC to ensure you have a great trip ahead of you. If you want to make sure you see all the sights during your stay in New York, it’s a good idea to plan your trip ahead of time. Think about the places you want to visit, restaurants you would like to eat at, and anything else you want to do while you are here. By planning in advance, you can create a schedule that maximizes your time in the city so you can fit as much as possible into your trip. You will also want to consider transportation and how you plan to get around the city. Are all of your destinations within walking distance? Will you be taking a taxi or will you have to catch the subway? By thinking about all of these things ahead of time, your trip is sure to go smoothly. While it’s good to plan in advance, you might decide not to do any of these things on your first day, but instead choose to take it easy. The most important thing is to do what appeals to you. Did you arrive to the city early and are now left wondering what to do with your bags until you can check into the place you’re staying? Odds are, the idea of dragging heavy suitcases and lugging backpacks around the crowded NYC streets doesn’t sound appealing to you. Instead of carrying your things with you all day long and exhausting yourself, consider storing your luggage. All you have to do is drop your bags off at a luggage storage NYC facility so you can enjoy your day without worrying about your belongings. Definitely check out City CoPilot, they provide this very service so you can focus on seeing the sights, without having to navigate the city with tons of bags in tow. While we do operate like a storage locker, we are much more convenient and safer to use than other luggage storage NYC facilities. And the best part? We don’t charge an arm and a leg to keep your things with us. We have locations in the Lower East Side, Times Square, and Brooklyn to make it easier for you to find a location to drop off your bags with us. It can be pretty easy to get caught up in the hustle and bustle of New York City. However, after you have been traveling for a while to get to your final destination, it’s important to give your body the nourishment it craves in order to keep going. After you have dropped off your bags and are free to roam the city streets, you should make grabbing a bite to eat a top priority. Eat a delicious meal and drink plenty of water so you will have enough energy to take on the rest of the day. After all, you want to feel refreshed and energized before you conquer a new city! If you have a busy day ahead of you, keep a bottle of water and healthy snacks on hand to keep your energy up. Long travels, especially on planes, can leave you feeling dehydrated and you don’t want to worry about feeling tired or fatigued in the middle of the day. Nothing will help you recharge after traveling quite like a stroll through beautiful Central Park. Take in the greenery as you walk around or relax on the lawn while watching the clouds go by. Getting some fresh air will help you feel refreshed and gives you the opportunity to see a different side of New York since you’re off the busy streets. You just might want to grab your lunch to go and have the perfect picnic on the Central Park grass! It would be impossible to come to New York City and not have a little shopping spree, right? With so many stores lining the streets, there are plenty of places to shop for all of the necessities. One of the most famous stores to stop in has to be the Macy’s Herald Square on 34th Street. This New York City landmark is one that you shouldn’t miss and will provide a great shopping experience. Plus, with your luggage safely in storage, you will be able to carry plenty of shopping bags instead! Even if you aren’t looking to do any shopping, the Macy’s Herald Square store is still an amazing place to just walk through, as so much history is within that building. There are so many sights to take in while visiting New York City that it’s impossible to see everything in one day. Plus, you don’t want to overload yourself with too many things to do on your first day. Instead of cramming your schedule with every single thing on your must-see list, select a few important stops for your first 24 hours. Make sure you take the time to soak up everything you see. Enjoy your time just exploring the city and being in the company of whoever you are with. Don’t be afraid to just walk the streets of the city, getting a feel for the vibe of New York. After all, if you get lost, you can always catch a cab to find your way again. When your day is over, you can grab your luggage and head to the place you’ll be staying at for a good night’s rest. One last recommendation, it’s never a bad idea to talk to a lawyer before you travel, have their number in your phone in case of an emergency. The last thing you want is to be stuck in the local jail without a plan. I know nobody plans on getting in trouble on vacation but things happen. It’s best to be prepared. Looking for a romantic getaway? The Sofitel Bora Bora Marara Beach Resort will certainly tick all the boxes. This unique over water bungalow beach resort will certainly give you a memorable vacation you will never forget. Bora Bora is noted to be the “Pearl of the Pacific” so get ready to pack your bags. To get there, you fly to Tahiti then take a short flight to Bora Bora. The resort staff will then meet you at the airport and take you by private boat to the resort. The Sofitel Bora Bora Marara is a 4 star resort…even though you will feel like you are at a 5 star. However you get to enjoy this beautiful resort for way less than the some of the 5 star resorts nearby. The Sofitel Bora Bora Marara Beach Resort is located on the main island of Bora Bora on the southeastern coast. The location is perfect for enjoying other nearby shops and restaurants. 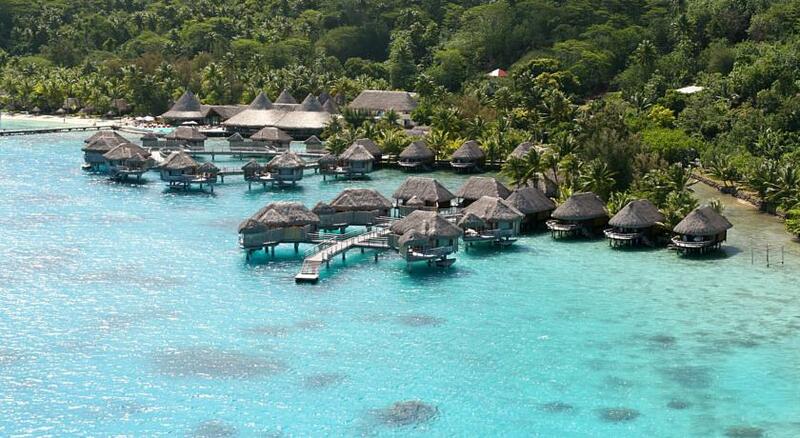 The Sofitel Bora Bora Marara Beach Resort is comprised of only 55 luxury bungalows including 33 over the water. Choose from beachside, garden, or over the water bungalows. Each room offers a king sized bed plus a sofa bed. You also will enjoy your own terrace. Don’t forget about the day loungers to soak up some sun, outdoor shower, separate bathtub and rain shower, and of course the mini bar and infinity edge swimming pool. Wi-Fi is available for those that can’t break away from those chains LOL. 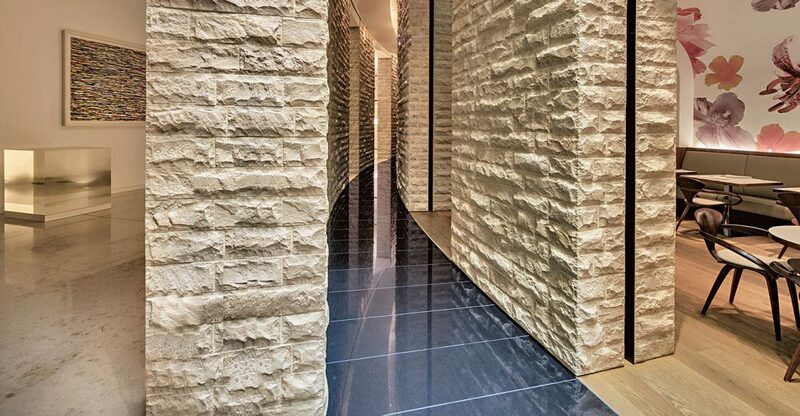 The Sofitel Bora Bora has Le Spa that offers a variety of rejuvenating beauty treatments. 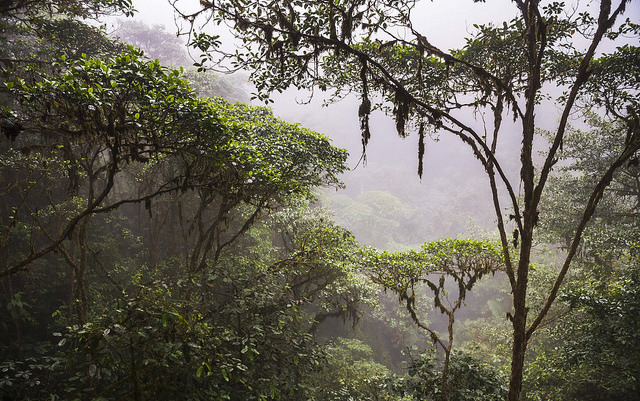 Relax with a soothing massage in the mist of the beauty surrounding the resort. The Sofitel Bora Bora Marara Beach Resorts sounds like a lovely place to visit. Talk about a getaway. This resort offers a once in a lifetime experience in a beautiful setting. Not only that but Bora Bora is a fraction of the cost of Fiji and every bit as beautiful. Looking for a great hotel to stay out in the mountains of Colorado? 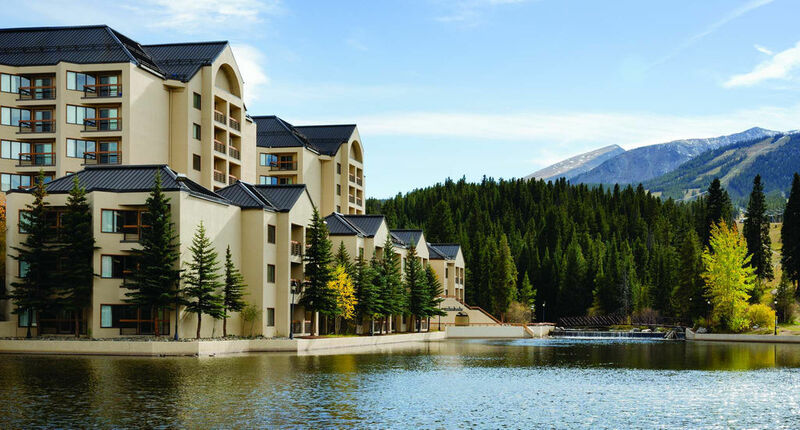 The Marriott Mountain Valley Lodge in Breckenridge is a great choice! The views of the mountains are extraordinary and it sits right on Maggie Pond giving wonderful water views in the summer as well. 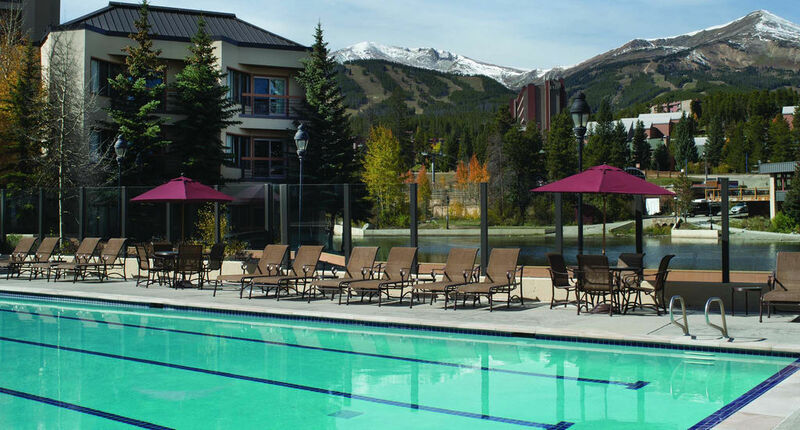 Conveniently located to the Breckenridge and Arapahoe Basin ski resorts in the winter. Has a heated pool, whirlpool and many other amenities you will love. Some rooms have kitchenettes too so you don’t have to eat out for every meal. This Marriott hotels always has great rates, but you can check for any current Marriott promo codes to help you save even more on your stay. You can sometimes save up to an extra 40% off. Can’t beat that! Always good to save where you can especially if you are looking to go skiing. The Mountain Valley Lodge has a couple different room choices for you. 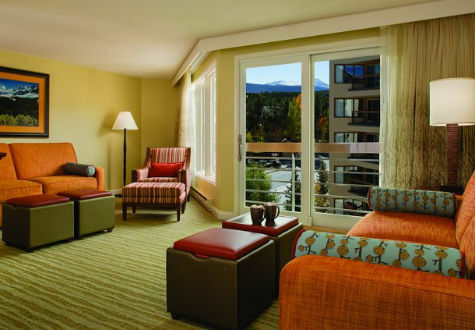 One note – there is no air conditioning..but you really don’t need it in Breckenridge. This hotel doesn’t have any restaurants or bars on premise. As mentioned though they do have fully equipped kitchens in the rooms though. You can also order delivery from many local restaurants. Of course being in Breckenridge there are many great restaurants in town for you to check out. We enjoyed the Hearthstone Restaurant and The Canteen. Both are pretty close to the hotel and worth checking out. This would be a great hotel for you and your family to spend your holiday vacation at! Whether you are going for winter vacation and are looking to go skiing. Or looking for a place to get away in the summer in the beautiful mountains of Colorado. The scenery couldn’t be much better and the rates are very reasonable. Love the fact that they have fully equipped kitchens to help keep eating out cots down, especially if you are with a large group or family. My family always likes staying at the Marriott branded hotels because of how comfortable the beds always are LOL. But we also know they rooms will always be clean and the service good. Marriott Hotels usually are very consistent and have high standards. If you are looking for a vacation of relaxation and fun, The Buffalo Thunder Hotel in Santa Fe, New Mexico is a 4 star gem. Nestled in the shadows of the Sangre de Cristo mountains, this hotel is the perfect place to stay. Buffalo Thunder comprises of 393 rooms and suits all luxuriously appointed and designed by Southwest Native style of the Pueblo of Pojoaque. Buffalo Thunder comprises of 393 rooms and suits all luxuriously appointed and designed by Southwest Native style of the Pueblo of Pojoaque. The colors of the desert Southwest are not only inside your room, but just outside your balcony or window. 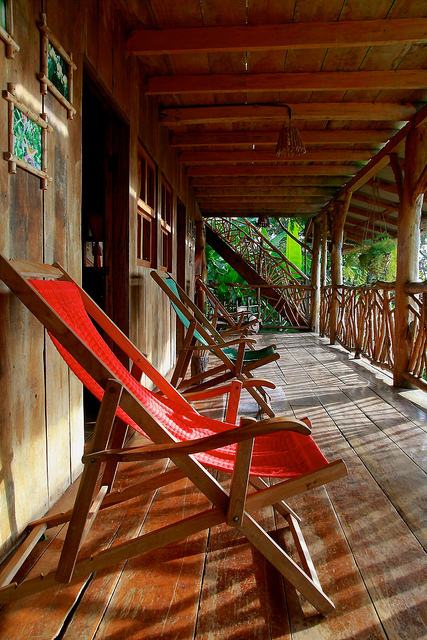 Drink your morning coffee on your balcony while inhaling the breath taking views around you. The Buffalo Thunder Resort has a variety of restaurants and bars that will meet your carvings and needs. Pamper yourself at the Wo’P’in Spa. The spa offers a full menu of spa option including skin treatment, massage, a steam room, as well as, full salon offering hair, nail services, and waxing. The Buffalo Thunder Resort and Casino offers almost 70,000 square feet of gaming area. There are table games, 1200 slot machines, and a dedicated poker room. Win big at the Buffalo Thunder Casino! The “best golf course in Santa Fe” that offers 27 holes over 3 courses. The Buffalo Thunder Resort Hotel and Casino is part of the Hilton family of hotels. Along with the views you can enjoys all the amenities such as the pool, spa, golf, and the casino. At the Buffalo Thunder Resort and Casino offers something for everyone. 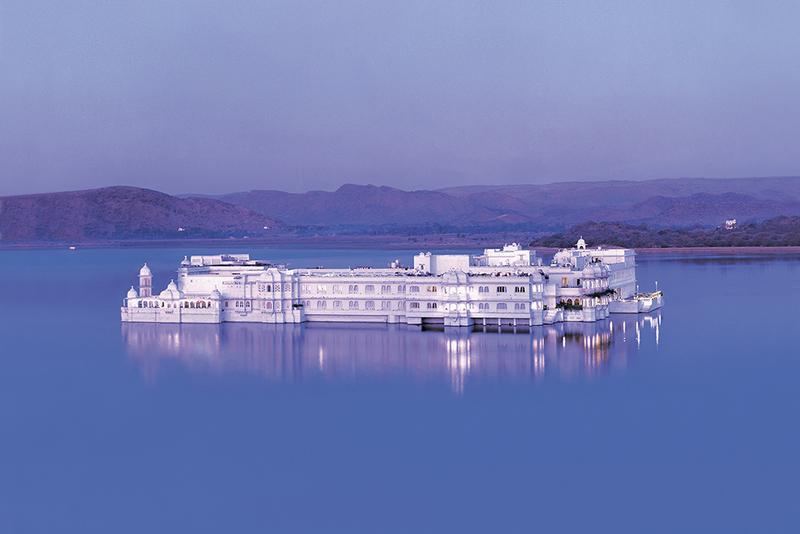 The beautiful Taj Lake Palace Hotel is a unique experience you will want to check out. This could be one of the most romantic hotels in the world. The hotel was built in 1746 and sits in the middle of Lake Pichola in southern Rajasthan, India. You take a small boat out to the hotel where you are immediately taken in to the charm and luxury of this palace. You arrive to a shower of rose petals and choice of refreshment….and the hospitality doesn’t stop there. As we mentioned this a truly unique experience. The hotel has 66 unique rooms and 17 suites all with amazing views and luxurious amenities. 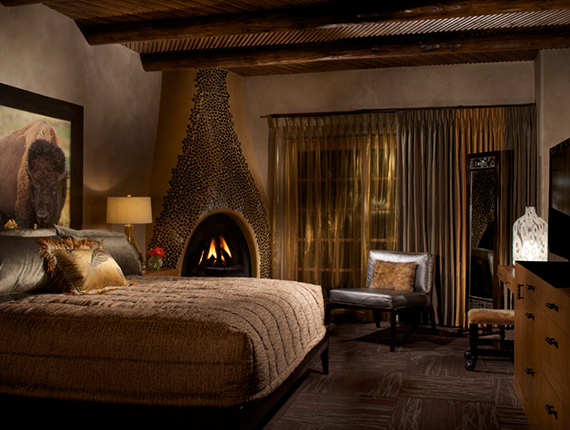 One of the coolest suites in our opinion is the Grand Royal Suite (pictured below). The view from the bathtub is just spectacular. But you really can’t go wrong with any room you choose. Of course the Presidential suite looks really nice too. The hotel has 3 amazing restaurants and one bar. Neel Kamal – authentic cuisine from Udaipar and India. Bhairo – rooftop restaurant with amazing contemporary European cuisine. Jharohka – more of an informal restaurant with cuisine from all around the world. Amrit Sagar – great bar with wine, spirits & cigars. This a truly unique spa experience that you must try! The spa is actually on a small boat that sails you around Lake Pichola whice you are getting your treatments. The spa offers specific indian therapies, scrubs and beauty treatments. I can’t say enough about how beautiful this hotel is. The location, the beautiful marble buildings, the breathtaking views and the fact that it’s in the middle of the lake all make this a unique and very romantic experience. The hospitality is top notch, they make you feel like a royal and the food and accommodations are just as amazing. Make sure you do the Heritage Walk as well. It a tour of the palace where you can learn all about the unique features and see all the beautiful parts of the hotel. This amazing Five Star hotel located in Zurich Switzerland would be a marvelous place to spend your holiday vacation! Located near the edge Adlisberg forest and is only minutes from the Zurich city center. The hotel looks over the city and has some breathtaking views. 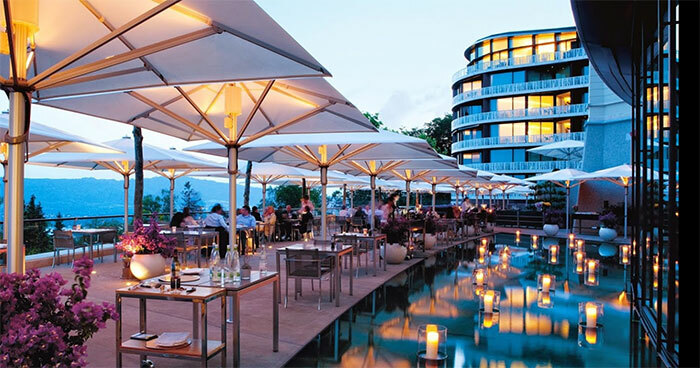 The Hotel also includes some very good restaurants, bar and a renowned Spa & Wellness center. You can also use their facilities (holds up to 900 people) for any events or celebrations you are putting on. Everything at the hotel is truly first class and you will feel like a celebrity when you stay. For lunch they have an amuse-bouche menu which allows you to try an exciting selection of the chef’s dishes. Or they also offer an a la carte menu and 4 or 5 course meal choices as well. For dinner they offer 5 and 8 course meals, which you can get a vegetarian alternative, or a 12 course Tasting Menu. There is also an a la carte menu available for dinner as well. If you are a wine drinker than you will definitely want to check out the wine selection here too. Over 500 choices and some very rare bottles as well. You are sure to find a new gem with their huge selection! Talk to the Sommelier and get some suggestions in the price range you are looking to stay in. The Saltz restaurant surprises guests with an international flair. The food is straightforward but amazing. The chef believes strongly in using locally sourced or grown ingredients. 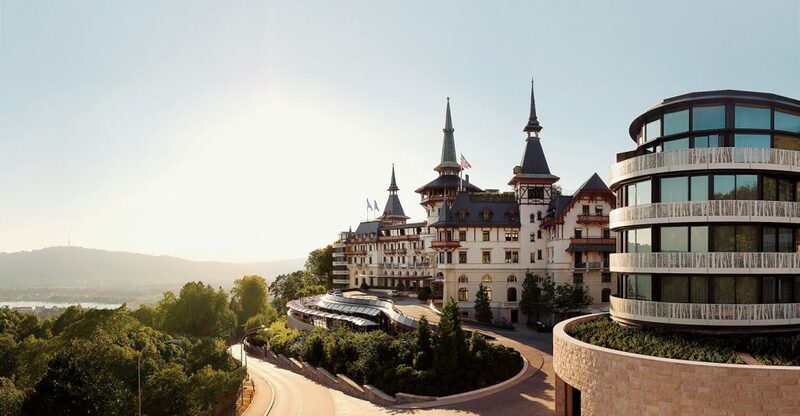 The restaurant has been awarded 14 GaultMillau points! You can’t go wrong with anything from the menu. The Saltz restaurant also has a great wine menu specializing in local Switzerland wines. They also carry wines from other regions close by throughout Europe. The Salt restaurant is where you can find the terrace pictured above. The restaurant boasts of two bars, the Lobby bar and the main bar where you can get specialty drinks, finger food and watch entertainment. They have inside and outside seating and the decor is just amazing. With The Dolder Grand being in Zurich near the Alisberg forest you can’t go wrong visiting for the holidays. The views are spectacular, the food and wine out of this world and the service impeccable. This 5 star luxury resort screams elegance and first-class. You won’t regret a second of your stay. We recommend a quiet afternoon in one of the two libraries with a good book and fabulous bottle of wine. You also should get out and check out some of the local attractions in Zurich like the Grossmunster Church, Lake Zurich and the Le Corbusier Pavilion.